Being the richest man in Indonesia for several years in a row that R. Budi Hartono, who is the owner of Djarum Group , was born with the full name of Robert Budi Hartono on 28 April 1941 in the city of Semarang ,Oei Wie Gwan His father was a small business owner renamed Gramophon Djarum Djarum who later became a tobacco company in the world. Robert Budi Hartono who have Chinese names Oei Hwie dicaatat Tjhong by Forbes Magazine has a wealth of 8.5 billion dollars or 82.50 trillion rupiah and is the richest man number one for several years in Indonesia and the order of the world's 131 richest . All started from Mr . Oei Wie Gwan which bought a small business in the field named Djarum clove Gramophon in 1951 dann later changed his name to Djarum . Oei began marketing cigarettes under the brand " Djarum " which turned out to be successful in the market . After a fire nearly gutted the company in 1963 , Djarum back up and modernize equipment in the factory . Robert and his brother is Michael Budi Hartono inherited it after his father died . At that time the company Djarum factory just burned and suffered an unstable condition . But then in the hands of the two brothers Hartono , Djarum company can grow into a giant corporation . In 1972 began to export the Djarum cigarette products overseas . Three years later the market Djarum Djarum Filter , which produced the first brand to use the machine , followed by brand Djarum Super was introduced in 1981 . Currently , in the United States was the cigarette companies have the large market share . And in his own native country , Indonesia , Djarum production reached 48 billion cigarettes per year or 20 % of the total national production . Along with its growth , this cigarette company was transformed from a tobacco company Business Group which invests in various sectors . Djarum them , banned in the United States since 2009 along with other cigarettes , as has been the launch of Dos Hermanos , a premium cigar tobacco blending Brazil and Indonesia. Robert Budi Hartono, with Djarum Group he leads also to expand to many sectors including banking , property , agribusiness , electronics and multimedia . Business diversification and investments made Djarum Group is strengthening its Business Empire that began in 1951. In the field of Agribusiness , Robert and Michael have palm plantation area of ​​65,000 hectares located in the province of West Kalimantan in 2008 . They move under the umbrella Hartono Plantations in Indonesia , one part of the Djarum Group . In the property sector , many projects are executed under the control of Djarum 's CEO , R. Budi Hartono , and the greatest Grand Indonesia is a mega project that ditantangani in 2004 and completed in 2008 . The project includes a hotel ( renovation of Hotel Indonesia) , shopping centers , office buildings 57 floors and apartments . Total value of investments 1.3 trillion rupiah . Globe Asia magazine stated Robert as Indonesia's richest man with a fortune of 4.2 billion dollars , or about 37.8 trillion rupiah . In the same year , R. Budi Hartono with his brother , Michael Hartono under the banner of Djarum Group expanded into investment banking sektot . And they became the main shareholder , controls 51 % stake in PT Bank Central Asia Tbk ( BCA ) which is one of the largest banks in Indonesia today . Based on data from Bank Indonesia late 2011 BCA asset value of Rp 380.927 trillion ( three hundred eighty point nine hundred twenty seven dollars ) . BCA was officially established on February 21, 1957 as Bank Central Asia NV . Much has passed since the founding , and perhaps most significant is the financial crisis that occurred in 1997. And evidence of the existence of Djarum Group is a skyscraper in Grand Indonesia complex mega project named Menara BCA . Because BCA bank became the main tenant from 2007 to 2035. Thus the operational environment tergabunglah two business giants Indonesia in the center of the capital which became evident in the business arena keberkuasaan Djarum Indonesia. Robert Budi Hartono married a woman named Widowati Hartono or more familiar with the name Jade Hartono . With him Widowati Hartono , PT Djarum 's owner had three sons who all have graduated . They are Victor Hartono , Martin Hartono , and Armand Hartono . On the other hand , Robert Budi Hartono Particularly liked the badminton sport that originated from a hobby and built Badminton Association ( PB ) Djarum in 1969 . Badminton court in the place of rolling cigarettes , Robert Budi Hartono find genuine talents talented youngster Kudus. The young man in the eye, have high morale , a great mental and physical specimen . Nothing wrong with intuition , because the period is not long , the boy the name of nation on the world stage . The young man was Liem Swie King , known by the nickname " King Smash " . 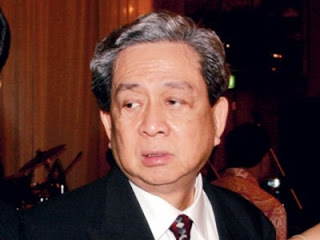 Besides, with his brother is Michael Budi Hartono , they became owners of Grand Indonesia and electronics companies . One of the Djarum Group businesses in this sector moves under the banner Polytron which has operated for more than 30 years . Polytron company is now also producing phones that were previously only meproduksi air conditioning , refrigerator , video and audio products , and dispensers . Through the company's newly created Ventures Global Digital Prima , they also bought Kaskus , which is one of the largest sites in Indonesia.